Don’t stress about breakfast when you have overnight guests! 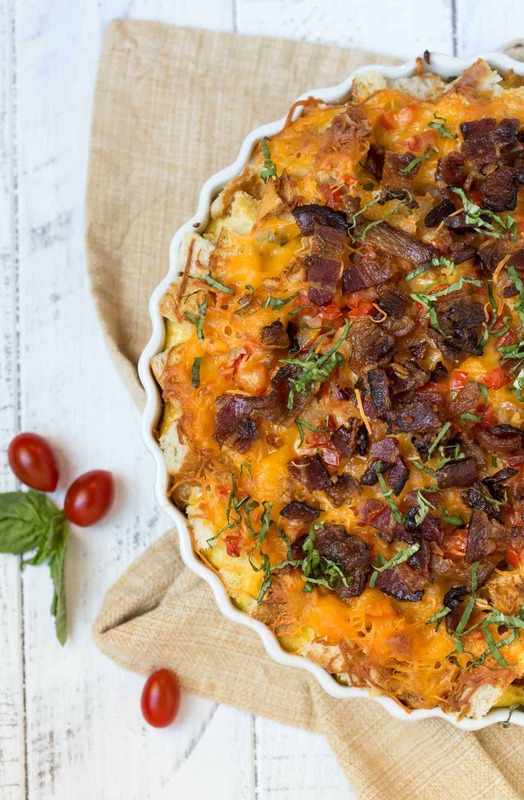 This make-ahead Bacon, Tomato and Cheese Strata makes brunch easy! Breakfast on long holiday weekends is something I really look forward to. After eating on the run during the week, I appreciate being able to take the time and savor this meal. 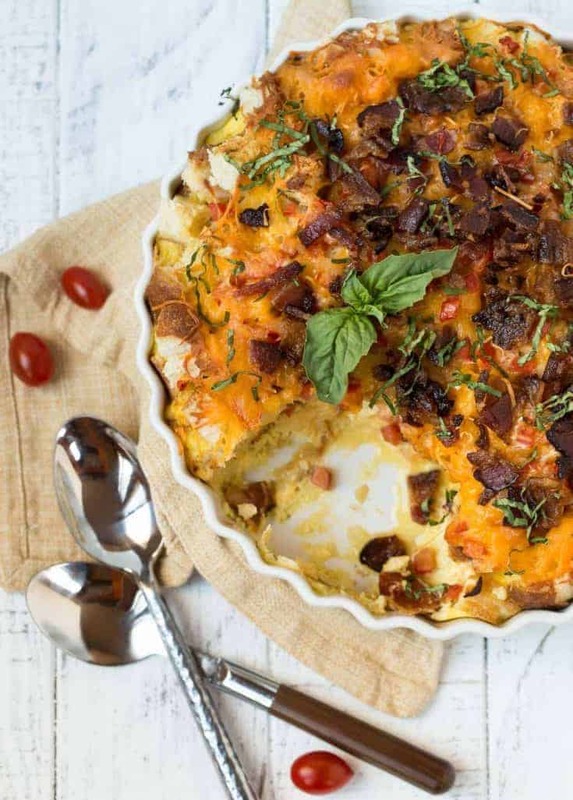 And brunch with a Bacon, Tomato and Cheese Strata fits that bill perfectly. Add some fruit, coffee and a Bloody Mary bar, and you pretty much just wrapped up the best hostess award. People can sleep a little later, read the paper over a couple cups of coffee, and just relax. What a fabulous treat for out of town guests! But truth be told, you WERE in the kitchen a lot over the last month, and, although you really want to be a fabulous hostess, you just want to drink your coffee and relax with everyone else instead of being a short order breakfast cook. 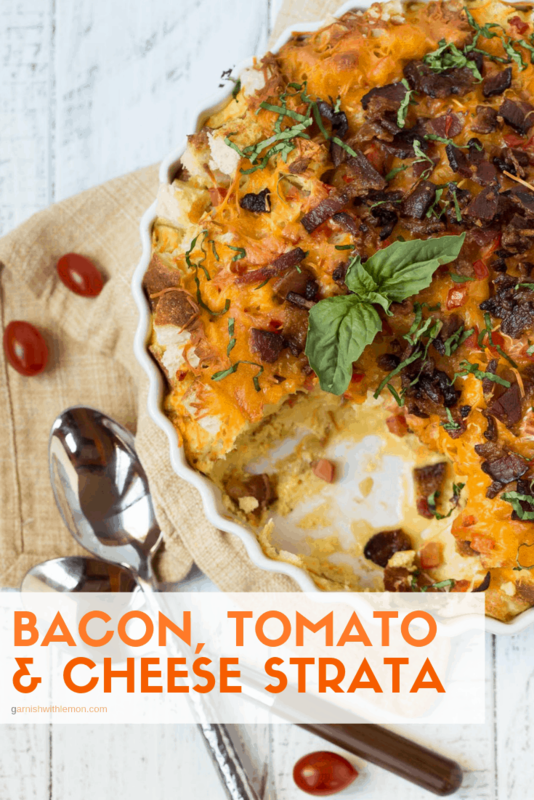 The beauty of this Bacon, Tomato, and Cheese Strata is you prep everything the day before, get up when you want and pop it in the oven. By the time people are getting going for the day, the strata is ready, too. Big fluffy layers of bread, eggs, cheese, tomatoes and crispy bacon…I pretty much just died and went to breakfast heaven. Now, it’s no secret that I love breakfast (and frankly eggs and bacon need to be involved for it to really be considered breakfast for me), but making a fabulous strata like this is not something I treat myself to frequently. That’s because I’m one lucky girl; most weekends my husband prepares breakfast for me – both days. Aren’t you jealous? I mean who doesn’t love to have breakfast made to order? No one I know. But with this Bacon, Tomato and Cheese Strata, I’m the rockstar breakfast maker, and Kevin gets the weekend off. Butter a 9 x 13 pan and set aside. Cook bacon until crisp. Remove from pan, let cool and chop. Reserve 1 tablespoon of bacon grease to saute the onion and garlic until tender. Toss onion and garlic with chopped bacon and set aside. In a large bowl, combine eggs, milk and seasonings and whisk to combine. Place 4 cups of the bread cubes in the 9 x 13 pan and pour half of the egg mixture over top. Top with 1 cup cheese, 1/2 of the onion mixture and half of the tomatoes. Repeat layers. Cover with foil and chill overnight. Remove foil and bake for 1 hour. Sprinkle remaining cheese over top and return to oven until the cheese melts and the center is set. Let stand for 5-10 minutes before serving.